Most Americans are not getting enough fiber in their diets. The average adult only eats 15 grams/day, but did you know the recommendation for males is 38 grams/day and women 25g/day? Here are some great facts on fiber from Kathleen Zelman, MPH, RD, is director of nutrition for WebMD. In order to add more fiber to your diet, it’s important to add more plant based foods to your diet. This includes fruits, vegetables, beans, whole grains, and nuts. Avoiding refined grains — such as white flour, white pasta, and white rice — and replacing them with whole grains is a great way to boost the amount of fiber in your diet. Soluble fiber is found in beans, peas, lentils, oatmeal, oat bran, nuts, seeds, psyllium, apples, pears, strawberries, and blueberries. Soluble fiber is associated with lowering LDL (bad) cholesterol, regulating blood sugar, and a lower risk of heart disease and type 2 diabetes. Insoluble fiber is found in whole grains, barley, couscous, brown rice, bulgur, wheat bran, nuts, seeds, carrots, cucumbers, zucchini, celery, green beans, dark leafy vegetables, raisins, nuts, grapes, and tomatoes. One of the benefits of insoluble fiber is that it helps keep you regular, prevents constipation, and reduces the risk of diverticular disease. Start your day with a whole-grain cereal that contains at least 5 grams of fiber. Look at the list of ingredients to be sure the whole grain (such as whole wheat, whole rye, or whole oats) is first on the list. Read labels and choose foods with at least a few grams of fiber per serving. A good source of fiber contains 2.5-4.9 grams of fiber per serving. An excellent source has 5 grams or more per serving. Toss beans into your soups, stews, egg dishes, salads, chili, and Mexican dishes. Substitute beans for meat in at least one vegetarian meal per week. Make snacks count as opportunities to enjoy foods high in fiber. For instance, snack on raw vegetables with bean dip or hummus. We are getting closer to the school season starting again, believe it or not! Here are some healthful tips to keep you and your children on track..
Stock up on basics: Peanut butter and jelly is a great brown bag lunch staple, so why not stock up? Peanut butter usually stays dry and fresh for a year and most sales are in August. Schedule play time before homework time: Children need to get physical activity before they get their brains active. After being in school all day, it’s best to let them play and then go on to finish their homework! Make a cup of tea: An Australian study found that drinking passion fruit herbal tea increases sleep quality, so share a cup with your children after dinner. Let the kids play chef: In order for kids to be comfortable around nutritious food at an early age, parents need to make healthy eating fun. Take a morning breather: Each weekday morning, find time to connect with your children to release them from any stress or anxiety they may be going through. Or, simply spend and enjoy an extra few minutes with them! Celebrate the first day of school: Make your family’s favorite breakfast in the morning or go out for ice cream after school. Make the first day a celebration rather than something to dread. Choose brain food, not junk food: A late night healthy snack that children can enjoy is frozen fruit. Freezing yogurt and a combination of fresh fruits on a Popsicle stick makes a delicious treat! Figure out meals in advance: Track down the school’s menu for the week ahead and decide what meals are okay to eat and what days you should pack a lunch. Practice what you preach: Often times, we don’t think children are looking at the way parents take care of themselves. Children look up to their parents– and the way they eat and exercise can have a big impact on what they think is wrong or right. Don’t emotionally grocery shop: Make sure your children don’t talk you into buying something that isn’t the healthiest option or what you had in mind to buy. Make a list before shopping and make sure to only buy what is on that list! Pretzels: You might as well call them white bread. The main ingredients in Rold Gold pretzels, for example, are enriched wheat flour (translation: white flour). The stats of a single 1-ounce handful of pretzels (110 calories, 23 grams of carbs, 1 gram of fiber) are nearly identical to two slices of plain old white bread. And don’t be fooled by pretzels that appear to be whole grain; most really aren’t. Post Honey Bunches of Oats Greek Honey Crunch: Whole grain flakes may be the first ingredient, but sugar in some form (e.g. honey, corn syrup, brown sugar) shows up on the ingredient list 11 different times. Flavored Yogurt: flavored yogurt can easily pack in the equivalent of as much as seven sugar packets!! Instead, buy plain yogurt and add your own fresh fruit to it! Granola: They may provide us with some whole grains, but most types of granola and granola bars are filled with added sugar – and a half-cup serving of some types of granola can pack in 300-plus calories – more than a McDonald’s hamburger or a Hershey Bar. Protein bars: There are tons of protein bars that, while they may be high in protein, also have just as much sugar, if not more! Be sure to read your labels! Are you looking to keep the weight off, but yet enjoy summer snacks during the heat? Here are some healthy options to choose from..
Smoothie: Aim for adding fresh fruit, ice, and non-fat yogurt if needed. Some places use ice cream or full-fat yogurt or add whole milk and high-sugar fruit juice, so make sure to ask or simply, make your own! Iced coffee: While the coffee itself isn’t high in calories, everything added to it can quickly turn into a high calorie beverage! Save calories by opting for low-fat milk, skipping the whip cream and choosing the smallest size. Frozen Yogurt: The new trendy, frozen yogurt places opening up can quickly add up to a high calorie treat! In order to keep it healthy– aim for low-fat yogurts and stick with healthier toppings like a variety of fruits or nuts. Frozen fruit bars: You can buy these in a grocery store. They are a quick, already portioned, frozen treat that are about 70 calories each and aren’t too high in sugar! Frozen grapes: If you haven’t tried freezing your grapes before, I suggest you give it a try! This is definitely a refreshing, healthy snack on a hot day! Frozen banana bites dipped in chocolate: Craving chocolate and you like bananas? This is a perfect summer snack for everyone! Just be sure to watch your portions. Grilled Pineapple: An easy recipe with only 4 ingredients: 1 20-oz can of Pineapple chunks in pineapple juice, 3 bananas, 1 lemon, and 7 skewers you can make 7 servings of a delicious treat! Instructions: Drain pineapple and slice bananas into small pieces (the same size as the pineapple). Stick pieces onto skewers and place on a plate. Squeeze lemon juice over the sticks, cover, and store in refrigerator until ready to grill. Grill at medium heat, turning every 2 minutes until slightly charred (5-7 minutes). Dust with cinnamon and enjoy! Can be served hot or room temperature. Snap Peas and Warm Goat Cheese: An easy snack with only 2 ingredients: 10 snap peas and 1 oz. of goat cheese. Instructions: Melt goat cheese in microwave for 10 seconds. Be careful not to overheat because the cheese will separate. Dip snap peas in goat cheese one at a time and enjoy! You can also use this warm dip with celery, carrots, and pretty much any veggie imaginable! Mango Parfait: Top plain Greek yogurt with chunks of fresh mango and a couple of tablespoons of granola. Strawberry Cheesecake Bites: Cut out the leaves and stems of 20 strawberries and fill each berry with the cream cheese mixture. Then, roll the tops of the berries in Graham cracker crumbs. What are some of your favorite summer time treats? How Do I Save Money & Eat Healthy? Here are some wonderful tips by Kristin Kirkpatrick, R.D to keep your meals cheap and healthy at the same time! We all sometimes feel like we can’t afford the healthier items in a grocery store, but with careful planning.. we certainly can! Keep a list & plan ahead — Budget experts say that making a list and sticking to it can help save you hundreds of a dollars a year on your grocery store bill. Look for the healthy deals — Dried beans, nuts, whole grains, lean meats and dairy, and herb products and produce are items that you’ll want to stock up on when a sale occurs in your local store. Meats and whole grain products can be easily frozen for use at a later date. Buy generic: You most likely won’t be able to tell the difference between brand name or a generic version! Make sure to sign up for a store card! You never know when you will receive sales from using it! Do not give into buying anything conveniently ready for you (ex. pre-sliced) it will always be more expensive! You can always freeze food items, so instead of making a food item go bad.. make more and get creative on how to use it for different recipes! Looking for a new, healthy recipe for the summer? Are you a peanut butter fanatic? 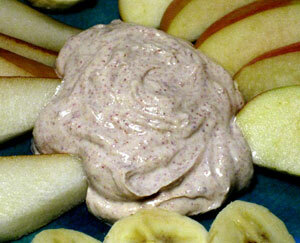 Than you must try this creamy peanut butter dip! Take one 5.3-ounce container of nonfat Oikos Greek Vanilla yogurt. Mix in two tbsp. peanut butter (I prefer crunchy), 1/2 tbsp. honey, and 1/8 teaspoon cinnamon. Serve with slices of apple, banana, and pear. Store unused portion in the fridge. Makes four, two-tbsp. servings. Each serving contains 66 calories, 3.75 grams of fat, .5 grams of saturated fat, .75 grams of fiber, and 5.5 grams of protein.